The College of New Jersey Honors Program provides challenging and stimulating opportunities to highly talented students who seek to enhance their educational experience at TCNJ. 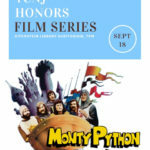 TCNJ College Honors is not a departmental program. It is a smaller community of like-minded scholars that serves students in all majors in all schools of the college. Students complete the requirements of the Honors Program by creating an individualized curriculum that includes a wide range of courses options. Because these courses satisfy liberal learning, major, or minor requirements, completion of the Honors Program does not require students to take additional courses, only different ones. Classes are even smaller than typical TCNJ courses, and many of the courses are only available to Honors students. 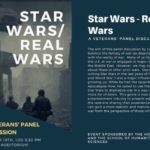 The aim of this panel discussion by combat veterans is to balance the fantasy of war (as depicted in movies and TV) with the reality of war. 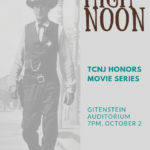 High Noon (1952) is possibly the all-time best Western film ever made - produced by Stanley Kramer and directed by Fred Zinnemann (who also directed From Here to Eternity (1953) and A Man For All Seasons (1966)). Props will also be available for those who want to take a more active role in this zany cult classic.